There are people you cross life paths with you want to share with everyone you meet. Sandra is one of those people for me. I love her work and her new book “Max Your Mind”. For those of us in the caregiving mode of living loving and laughing with challenging individuals a clear mind is a God send. 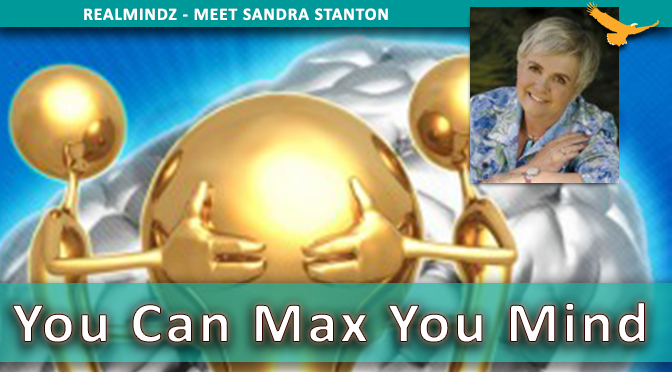 Thank you Sandra, I am excite to share you with my friends. We “Do Life” which are the are gifts we give ourselves. They keep our minds healthy. Sharing hugs and fist bumps boost our brains and emotions. Active muscles stimulate the brain and release healthy growth hormones. Brain chemicals or Neurotransmitter help us manage stress and mood. Our body generates natural feel good chemicals, endorphins, dopamine, and serotonin. Sing, Paint, Write! Your mind will love it! Order your personalized and signed copy of from her website, Amazon.com or your favorite book store or ask your library to order her book in paperback or e-format. This entry was posted in CONDITION, CONTINUOUS LEARNING, Jodee Kulp, POSITIVE AGING, SANDRA STANTON and tagged brain, development, support, training.